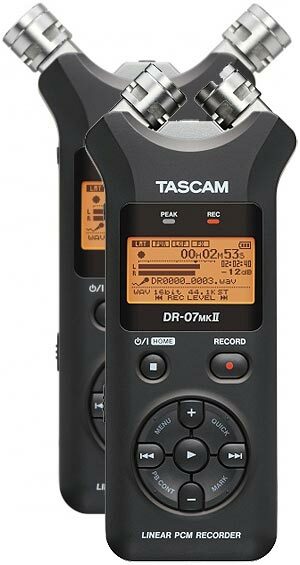 You could be forgiven for thinking that Tascam's follow-up to their enormously successful DR-07 looks more like a high-tech cattle-prod! But no - the DR-07MKII just sports an adjustable pair of cardioid condenser microphones that can be set up in A/B or X/Y orientation for a wide stereo field (A/B) or extra-clear reproduction with reduced phase displacement between both channels (X/Y). Nothing agricultural about that. 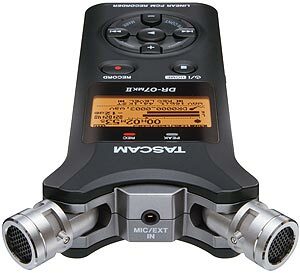 The DR-07MKII a is a portable, high-quality stereo recorder capturing audio at high resolution up to 96 kHz/24 bit to microSD or microSDHC media. Whilst the internal mics are pretty good, you can also use your own microphone or line-level source through the mini-jack stereo input which includes plug-in power for microphones that need it. Its thoughtful design means prime commands can be input just with your thumb, so operations like recording, adjusting levels, deleting bad takes and adding marks are only a button press away. Other features like variable speed audition, limiting, low-cut filtering, chromatic tuner and others more can be chosen from the menu. Users may apply one out of six reverb effects to the input or output signal, and an Overdub feature allows recordings to be added to existing audio files. The Peak Reduction feature automatically reduces the level to prevent accidental distortion. It works in rehearsal mode or in record and can be combined with the built-in limiter. There is also a Level Align function that allows to smooth out any sudden volume jumps during playback, and a mini-speaker is provided on the back panel for quick check-back. Internally, the unit’s digital and analogue circuit boards are built separately to improve noise performance, with a low-impedance design to decrease hiss further still. A separate supply voltage is used for the A/D and D/A converter for even better audio performance. The result is clean sound quality with high signal-to-noise ratio, very little distortion and wide frequency response. Two AA batteries can power the recorder for more than 17 hours, even while recording at CD quality. 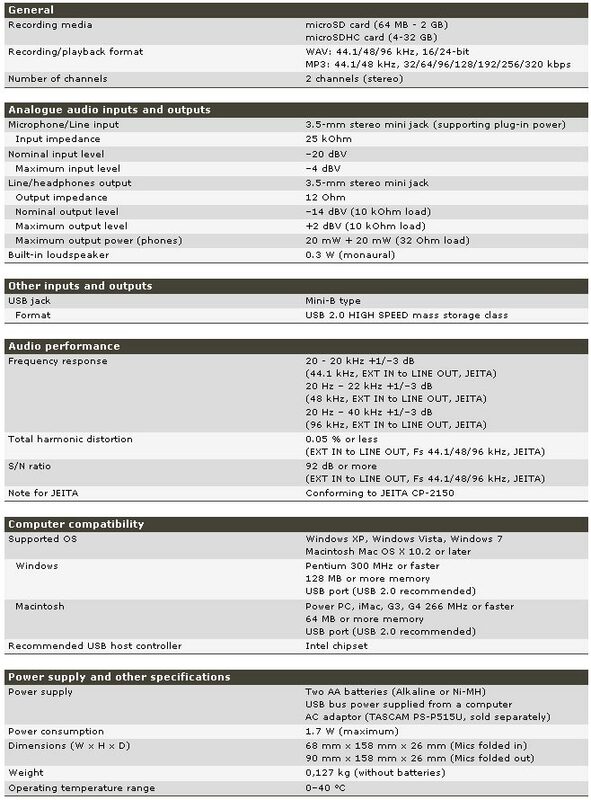 Operation by USB bus power or its optional AC adapter is also possible. Ideal for live music and field recording, news gathering etc.